What is the Portal PEZ? How are distinguished the resources available? According to what criteria are resources sorted? How to search in Portal PEZ? What is the difference between direct and remote access? I am studying / working on multiple faculties. Should I make some further adjustments? I can not log in, what do I do? Direct access does not work, what should I do? Resource is not available for my faculty. How should I proceed? 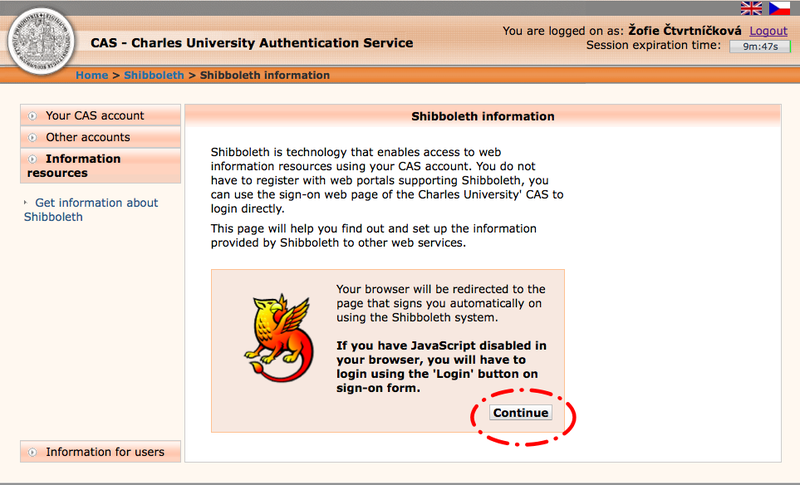 I have logged in via Shibboleth and access does not work. What might be wrong? What is the significance of shortcuts used on the Portal PEZ? The database is available to the UK, but can not get to the full text of a particular article. What is the problem? Are there any guidelines for remote access? What is SFX link resolver? What information sources are supported by the SFX link resolver? How does the SFX resolver work? What services are provided by SFX? Where to locate link to SFX on pages of information providers? I would like to know more information on SFX. What is MetaLib parallel search? How to get to MetaLib? 1. Electronic Resources at Charles University Portal (hereinafter PEZ) provides access to electronic information resources in science and research, which are open to staff, students and users of the Charles University. free resources – available freely for public use. by specialization - it shows all accessible resources of exact field/branch in alphabetical sequence. trial accesses - "trials" - are resources for checking-out, eventually for purchasing. If you would like to evaluate them, you can write your comment to facebook's field under resource informations or write directly to our email! useful links - here you can find different special resources and services (citation managers, learning materials etc.). direct access - use in case if you are working with computer connected to the network of the Charles University. The system will connect you automatically. You do not need any ID or password. This access is available from all public computers at Charles University, for all registered users (staff, students) connected by their notebooks. remote access - use in case if you are working with computer out of reach of University network. 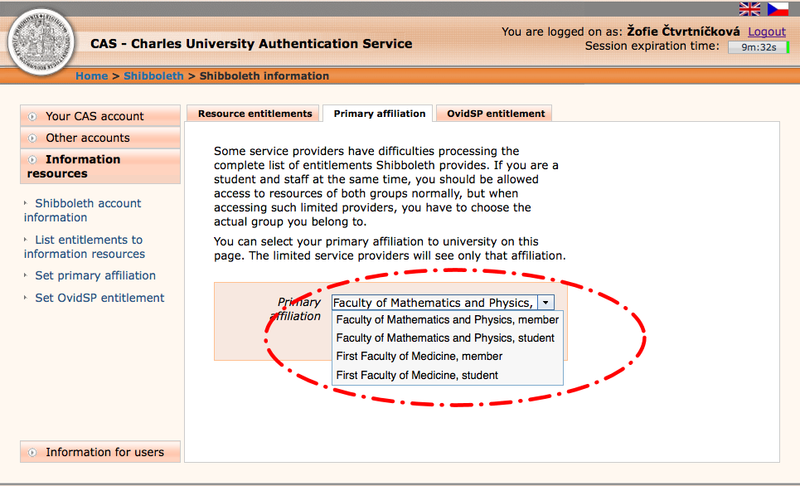 This access is available just for a staff and students of Charles University (account in Charles University Authentication Service is required). Specific resources are available for external registered users. 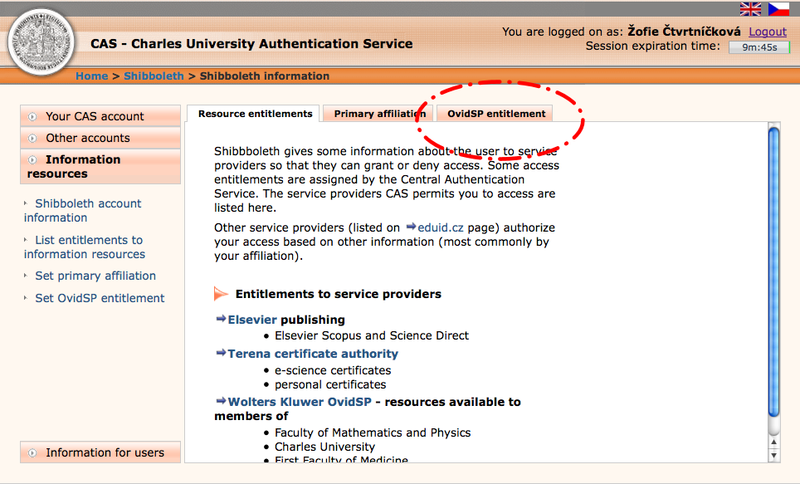 All resources, provided by this Portal, are made available with Shibboleth and EZproxy technology. 6. Shibboleth based remote access - institutional login - is a technology, which provides mechanisms for authentication in a computer network. It is supported at Charles University and allows remote access to selected electronic information resources outside the university network. By now there are available resources from Ovid, EBSCO and Web of Science, Elsevier Science Direct and Scopus, WilsonWeb, Cambridge Jounals, British Medical Journals and ebrary. We are expecting to be supported more resources in near future. Resources which support Shibboleth have this icon . You do not need any extra settings to use remote access (Shibboleth). Due to incomplete implementation of Shibboleth standard by some service providers (inf. resources) is not possible to use the so-called multiple roles (affiliations), as in the case of overlapping studies of more than one faculty or employment in parallel with the study. Therefore, the user must choose her/his primary role, which will be sent to the service provider. Settings can be changed anytime and is active again after logging in to the resource. Settings interface is availabe at CAS UK server - its URL is https://ldap.cuni.cz. Then, follow the pictures. 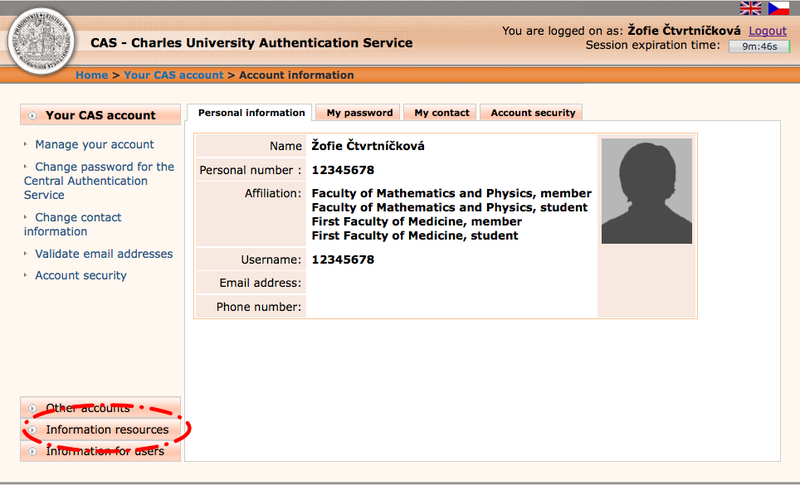 You have to know your university personal number and password. 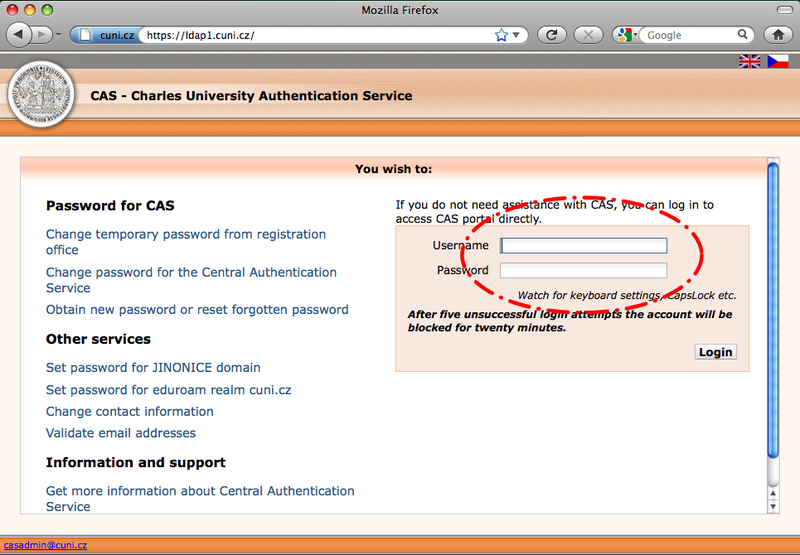 Try to log in and read all howtos and FAQs at CAS - Charles University Authentication Service page. 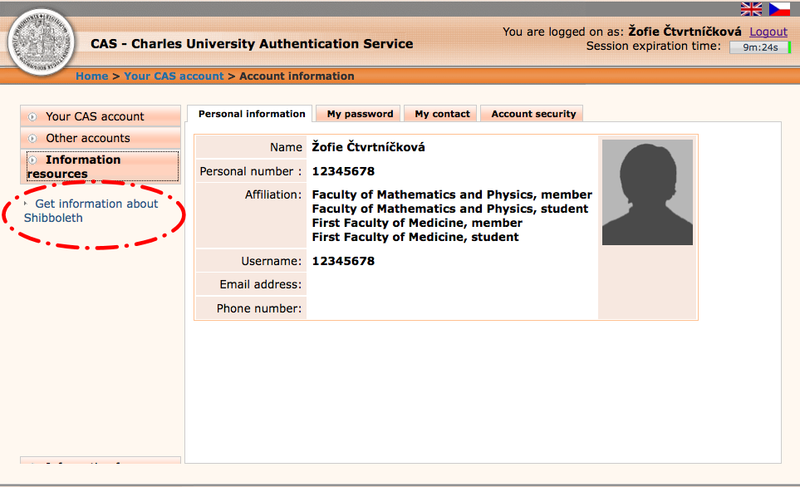 You are trying to log in to the resource, not subscribed at Charles University. Check if your desired resource is being subscribed in resources overview of Portal PEZ. Some of services suffered an outage. Please contact us with contact form. Some recources are available with direct access only - in the library. Come personally to the library who licensed your desired resource or contact library staff for more info..
9. You can test whether your computer is using an IP address from the Charles University IP address range. Link to test interface is here. use remote access services of library outside of Charles University - registration to the library might be required. A brief overview of these libraries offer on our site. 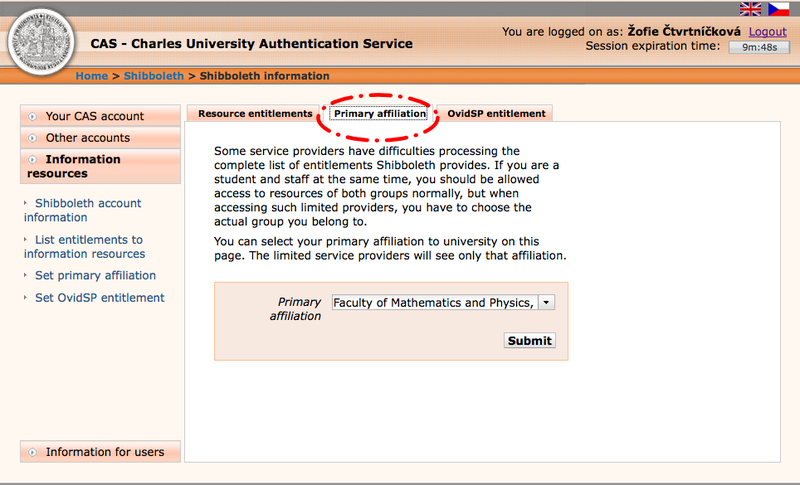 resource via Shibboleth does not work - use remote access via EZproxy or contact us using the form . 13. Not all documents in a specific full-text database are really full text available. In this case, please check if SFX service is available and see if the full text is available in another database. If you do not find the text in this way, contact your librarian or the contact person listed at source record here at PEZ Portal. 15. The SFX Link Resolver of Charles University in Prague (CUNI) provides connection to full-texts and other supplementary services of all available articles and ebooks. Connection is provided by the "SFX Button" and united menu of library services. Users are spared browsing one database after another and search the right one which contains the available document. In many cases is it enough to use one database only. Although it may contain just abstracts, users are guided to the right source by the SFX menu. 16. 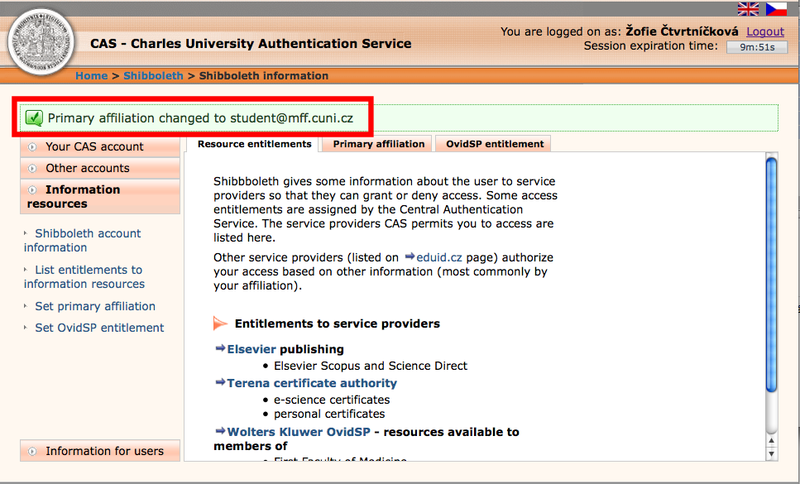 All main licensed sources available at Charles University in Prague support this functionality – (e.g. ProQuest, EBSCO, SpringerLink, Science Direct, etc.). Metalib, eJournals Portal and, for example, also Google Scholar. The whole list of all supported sources is available here. 17. The SFX services run by a OpenURL technology - standardized format of Uniform Resource Locator. It contains all important metadata of searched document. These metadata are sent from a source (Ebscohost, Web of Science, Pubmed, Google Scholar, etc.) to the Link Resolver which keeps all locations of full-texts (including supplementary services) in its Knowledge Base. The Link Resolver compares the query with the data stored in Knowledge Base and generates an easy-to-read user menu containing all activated services. Connection to full-texts of electronical articles, journals and books across databases by the "SFX Button"
Some sources do not support the standard button and offer several other variants of alternative buttons, or connection by a text link. 20. Detailed information about SFX - describing of the system and its components, help files, reports, resources and targets SFX UK, menu examples, support contact - you can find at SFX UK info page. 21. Information Gateway of Charles University - MetaLib - offers to students and teachers uniform access to many free and licensed information resources and databases by various vendors, including additional services. All necessary information and how-to is available in MetaLib help.